This is slightly different post than others. I always liked to find out, what other bloggers use to blog. I always had been a laptop girl, I went through 5 laptops so far. My first laptop was from Dell, around 8-10 years ago, then I got an upgrade to Sony (I received Sony after my dad, when he got himself new laptop). It was very similar to this one but it was white. One day someone had broken to our house and it got stolen (sad times). After 6 month I received HP, the worst laptops brand ever!. After a year of using it wouldn't charge, I kept on buying new chargers but nothing really helped. I got an replacement, and the same thing happened to it again. This pink baby was a Christmas gift which I received in 2010. It's still working really well! As you may notice on the last photo, it's has my name engraved! I love my parents for this lovely gift, I hope it will stay with me for couple more years. I hate getting new laptops, and moving/copying every files. The colour is lovely, back then I was stuck when choosing the right colour, I was thinking about purple or blue. What do you use to blog? Do you like laptop to use laptop, or do you prefer to sit at a desk with standard computer? What a cute coloured computer! I feel the same about laptops they don't last long at all I've had about 3 so far. I use a Macbook pro now and it's nothing short of amazing, they seem to last a lot longer than other brands too. I use a HP! I hope mine doesnt break like yours! Ive always got on with it really well and ive had it for just over a year now! I use a MacBook Pro and love it, so much faster and lighter than my old laptops! So that does it: HP clearly has some flaws to correct on its equipment. I'm never buying HP again. I still have that laptop and when it's turned out, it becomes really hot and the ventilation makes a racket but clearly doesn't work. 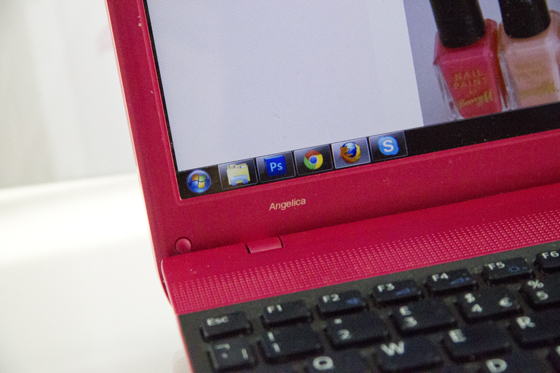 OMG PINK LAPTOP. Pretty much the coolest thing I have ever seen! I use a red Samsung laptop and I don't have a desk so all my computing is done lying down in bed haha. this is such a cute laptop! LOVE the color!